HootSuite introduces another batch of tools to the App Directory – welcoming Twitter analytics tool SocialBro, polling platform GoPollGo, outreach marketing app NeedTagger, and video creation app Videolicious. 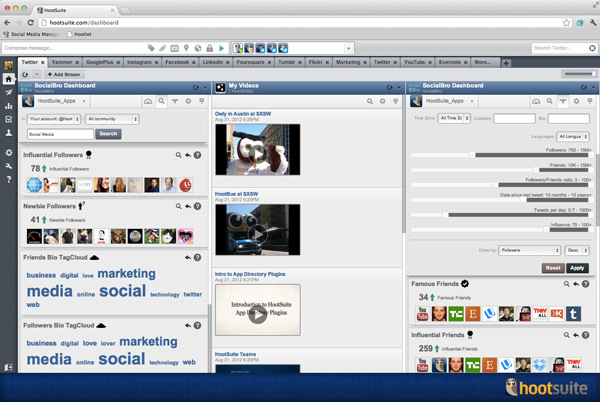 Using this latest wave of apps, HootSuite users can learn more about their audience by getting demographic information, filter social messages to connect with prospective customers, survey their audience for opinions and share videos to social networks. Using 10 powerful filters, the SocialBro app provides advanced information about your Twitter community allowing you to create better, more targeted messaging. Measure your success by tracking new followers and unfollowers, identifying influential followers, active followers and more. Tailor messages to specific market segments using the app’s filters for audience location, language, time zone and more. GoPollGo is a simple way to get feedback from your friends, followers and users. 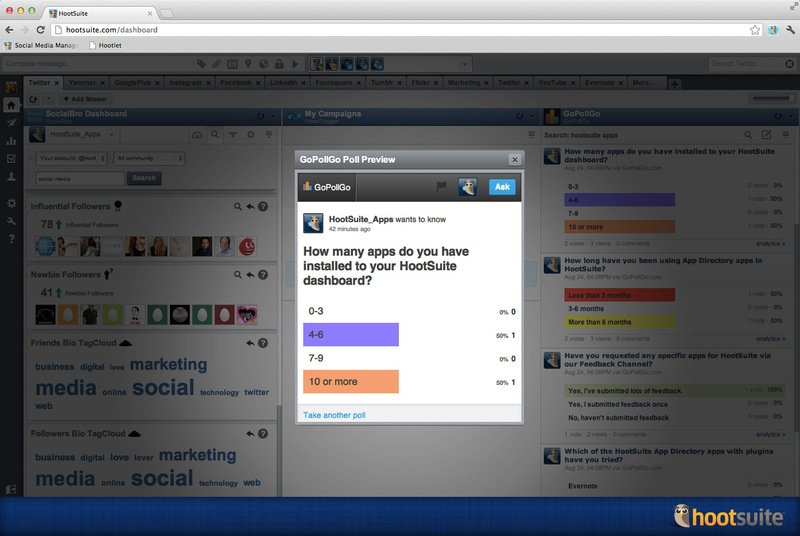 Create polls, quickly share them to your social networks and view real-time results directly from the HootSuite dash. Incorporate your audience’s opinion into business and product decisions. NeedTagger makes it easy to find and engage directly with prospective customers on Twitter. Filter Tweets from people reaching out publicly for products and services that you can provide. Set up a stream of needs for your business by selecting one of over 50 pre-tested filters for your industry. NeedTagger filters identify Tweets requesting specific products, services and content. 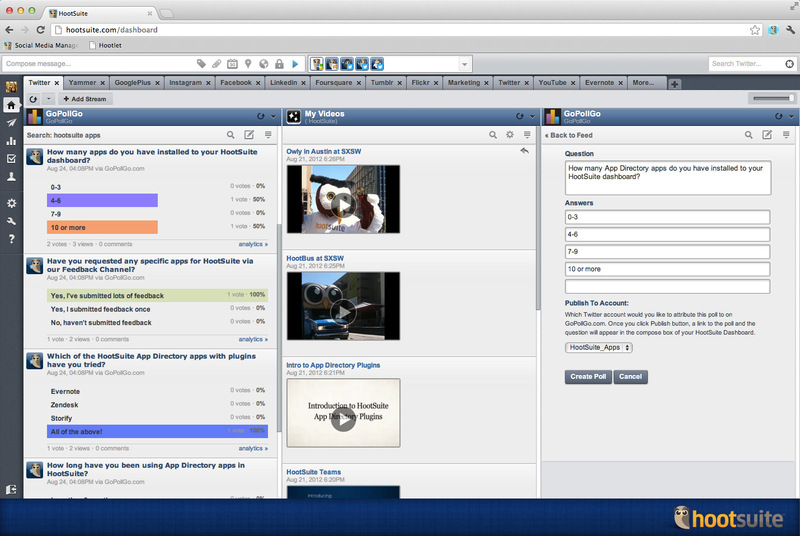 It’s easy to make professional quality videos with Videolicious, and now it’s just as easy to stream, view and share your polished videos directly from the dashboard. HootSuite strives to create a collection of the best features of our users’ favorite tools. You can look forward to more tools geared towards Customer Support, CRM, Digital Marketing, Publishing/Content Curation and more. What would you like to see next? Let us know by contacting us on our App Directory Feedback Forum. Are you a developer looking to work with HootSuite? Learn how you can integrate your app using the App Directory SDK. 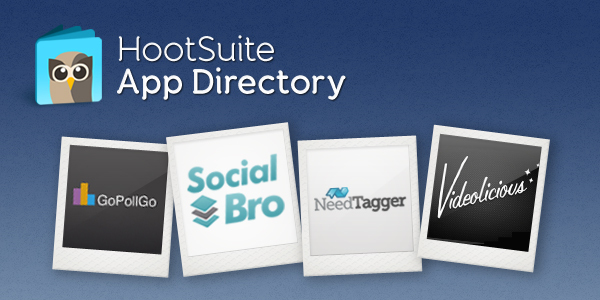 For the latest updates and tips about the App Directory, follow @HootSuite_Apps on Twitter.